Government of India has again increased Service Tax Rate. If you are searching for Service Tax Rate in india, you can find all the details here. Service Tax is additional indirect tax we pay for service we use. Apart from Service Tax, we have 20+ Taxes in India. Here we have explained everything about Service Tax, Service Tax Payment, Service Tax Rules and much more. Service tax is added to the goods and service price for which customer needs to pay additional price. Money collected from service tax are distributed between central government and state government. we will start with current service tax rate, and additional cess which added upon existing service tax. But, In Union budget 2016, Finance minister Arun Jaitley has announced 2 new additional cess, Swachch bharat cess and Krishi Kalyan Cess. Krishi Kalyan Cess = 0.5%. 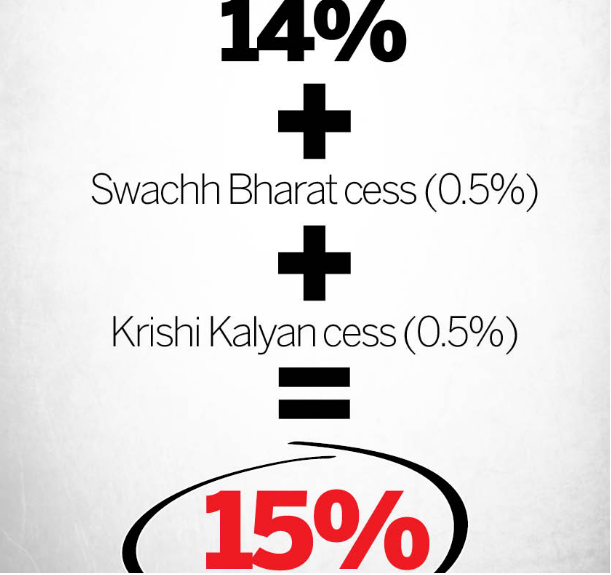 Total Service Tax = 15%. Note :- Krishi Kalyan Cess is just introduced from 1st June, 2016 (which was announced on Union budget 2016, in Feb, 2016). Why Government levies Service tax and cess on goods and service we consume? As per the research, only 3% population of india is paying Income Tax in india. So, to provide funds to other government policy, schemes, programs, Government collects Service Tax. As mentioned above, Service tax is extra added to goods and service and no where related to income tax. How much Government of india earns via Service tax and Cess? As per the official data, in the year 2015-16, government of india earns Rs.1,81,850.54 cr. While Cess gives around 18.6 % share in service tax.Almost large part of taxes comes from service tax, after income tax. How much burden consumers need to bear with additional cess? Since after adding two additional cess, (swachch bharat cess and krishi kalyan cess), we are now paying 1% extra on all service. Below is particle example of Service tax calculation. So, For service of Rs.1000/-, you are paying additional Rs.337.41 as Tax. Central government will be more interested to add cess than increasing service tax because, Cess is directly goes to central government's account (state government gets nothing) while from service tax, central and state govt both gets its share.